We share buildings, fields, laboratories, ponds, and greenhouses, but perhaps the most important thing we share is science. And as a strategic partner, the United States Department of Agriculture’s Agricultural Research Service (USDA-ARS) mission to conduct research to develop and transfer solutions to agricultural problems of high national priority is closely aligned with the Mississippi Agricultural and Forestry Experiment Station’s mission to advance agriculture and natural resources through teaching and learning, research and discovery, and service and engagement. The partnership includes collaborations on 23 active projects with 21 MAFES scientists. 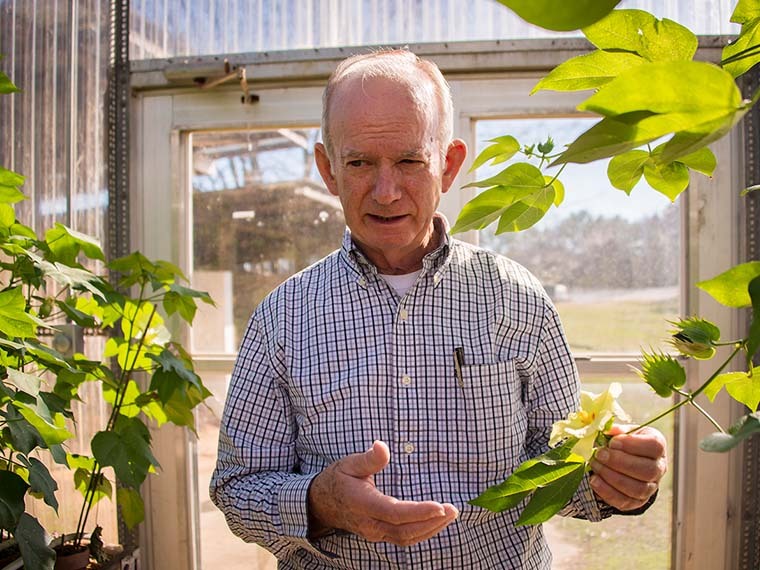 Facilities are shared at the Delta Research and Extension Center in Stoneville, the MAFES South Mississippi Branch Experiment Station in Poplarville, and on the MSU campus in Starkville. At the Delta Research and Extension Center campus, USDA-ARS employees are embedded with MSU scientists and extension specialists in the Thad Cochran National Warmwater Aquaculture Center. Scientists from MSU and USDA-ARS conduct research on production systems, nutrition, and health of aquaculture products, namely U.S. farm-raised catfish. The research is making an impact with increases of 30 to 40 percent yield from the use of hybrid catfish, the split-pond production practice, and the newly developed catfish vaccine to combat enteric septicemia. All three technologies were developed as joint efforts between USDA-ARS and MSU. Dr. Craig Tucker, the USDA-ARS research leader for the Warmwater Aquaculture Research Unit and former MAFES scientist, understands the importance of the partnership from both sides. The work doesn’t stop there though. Tucker added that scientists at the main MSU campus are working on food safety and postharvest technology as well as other economically and important aquaculture species. The Jamie Whitten Delta States Research Center, the southeast regional hub for USDA-ARS research, is also located on the Delta Research and Extension Center campus. Scientists in the USDA-ARS center work closely with MAFES agronomists and entomologists to assist row-crop producers in increasing yields and profits, while reducing inputs and protecting the environment. At the MAFES South Mississippi Branch Experiment Station in Poplarville, USDA-ARS scientists and MAFES scientists work together in the Thad Cochran Southern Horticultural Laboratory, pursuing research to establish the best agronomic and pest management practices for vegetable and fruit growers along the Gulf Coast. On the Starkville campus, USDA-ARS works with MAFES scientists in food safety, poultry science, genomics, and agriculture. USDA-ARS supervisory research geneticist Paul Williams has an office in Dorman Hall and works with numerous MAFES scientists and College of Agriculture and Life Sciences’ graduate students on aflatoxin contamination in corn. Jack McCarty, a USDA-ARS research agronomist and MSU alumnus, has mentored numerous undergraduate and graduate students in cotton research. Similarly, USDA-ARS scientists in poultry work with MAFES scientists in agricultural and biological engineering to build energy efficient poultry houses. USDA-ARS scientists also work on poultry projects in nutrition and disease prevention. A new partnership with USDA-ARS and MAFES will establish the Mississippi Alluvial Water Research Center. The center will investigate, conduct research, and solve problems related to the conservation and sustainability of water resources for agriculture in the Lower Mississippi River Basin, including the development of integrated irrigation and crop management systems that increase profitability, improve soil health, conserve water, and protect water quality throughout the Mid-South. The long-term partnership between MAFES and USDA-ARS results in improved animal and crop production systems as well as a safer food supply to benefit all Mississippians.